Recently, we were invited to join some friends at their lake house in Pennsylvania. Let me tell you, it was amazing. There was a lot of delicious food to fuel the days spent paddle boarding, water skiing and just playing in the water. Our hostess was a total rock star and put together a delectable menu while I mostly made sides and played sous chef. One side I made early on in the trip was sautéed broccoli. 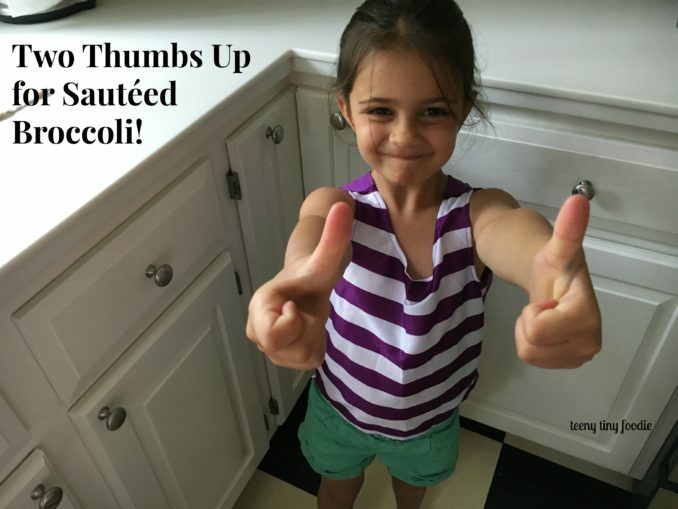 It’s so simple and easy to prepare, but more important, it was so yummy that it was a huge hit. The entire house devoured it from the most skeptical carnivores to the wary kids that fear eating anything green. The host even said, “This is better than potato chips!” (For real!!) And it is so easy to make with barely any ingredients. 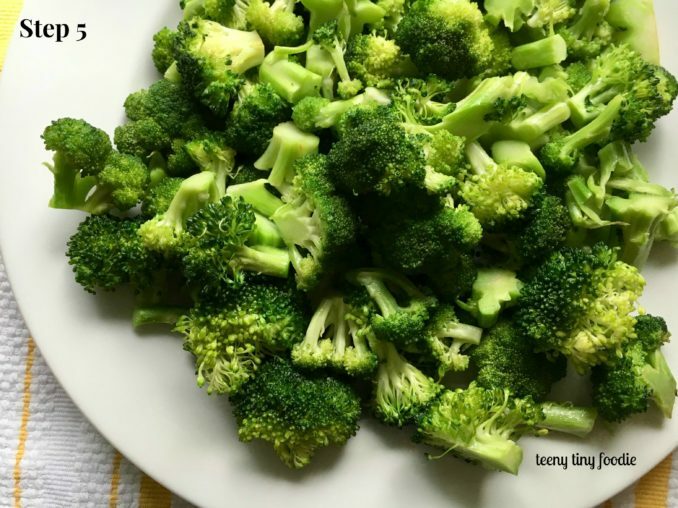 You just need broccoli*, olive oil, some cloves of garlic and salt. 1. The first is using the right amount of heat. Medium heat is the ideal temperature to use but you may need to adjust it to your particular stove. I’ve found that in my “new” kitchen in the burbs I use a temperature just below medium whereas the stove in our apartment in Brooklyn was the perfect temperature at medium heat. 2. Second, you want to stir your vegetables often so they lightly brown but do not burn or overcook and become mushy. You don’t have to stir them continuously, but don’t walk away from the stove either. 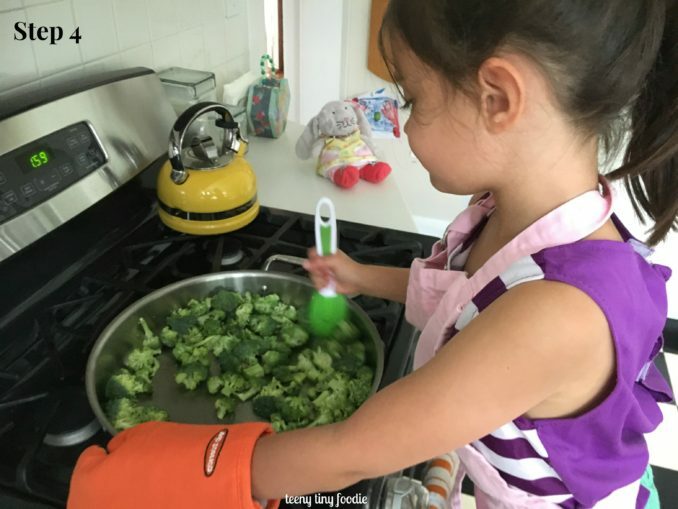 As you’ll see from the photos, Eliana helped with every part of preparing this recipe: tearing the broccoli into florets, pouring the olive oil into the pan, adding the broccoli to the pan, sprinkling it with salt and stirring it all together. I was in awe of my little lady! 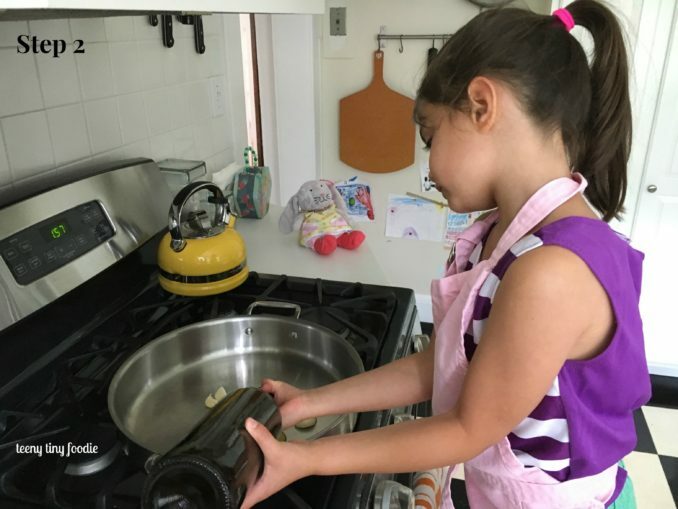 But, before you send your own teeny tiny chef into the kitchen to cook for you, make sure to teach her or him about being safe around the hot stove. I only recently began not hovering over Eliana to make sure she isn’t too close to the flame! Make sure your chef isn’t wearing any loose clothing and find oven mitts that fit his or her hands. 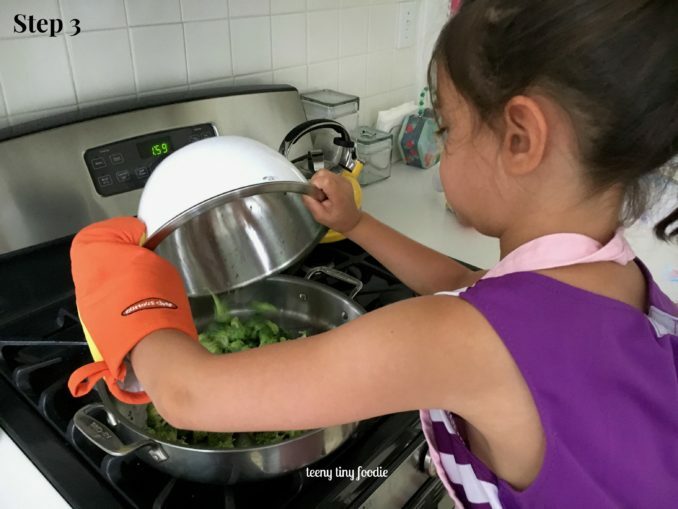 Eliana was super excited to use her new oven mitts from Curious Chef that fit her teeny tiny hands perfectly. 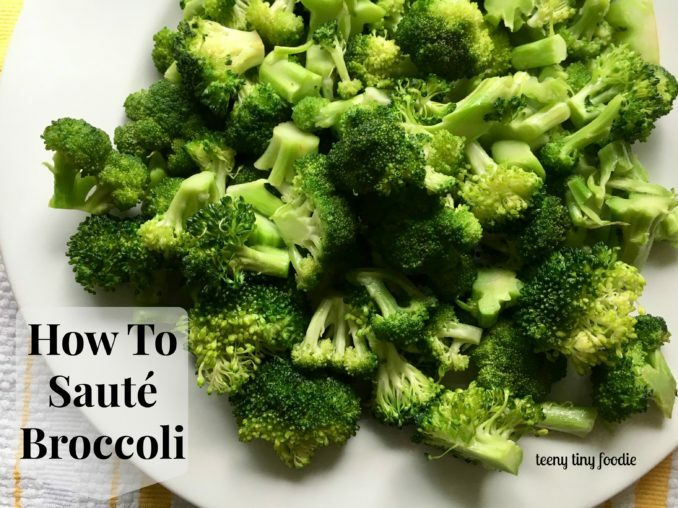 *I’ve chosen to share this recipe while using broccoli but I also prepare a bunch of other vegetables this way such as zucchini, cauliflower and various greens to name a few. 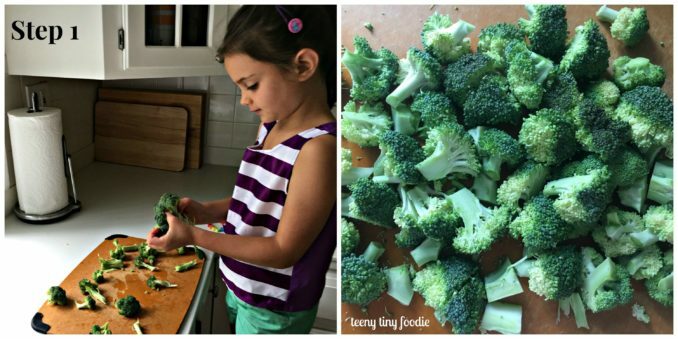 Step 1: Chop or tear broccoli into small florets and set them aside. 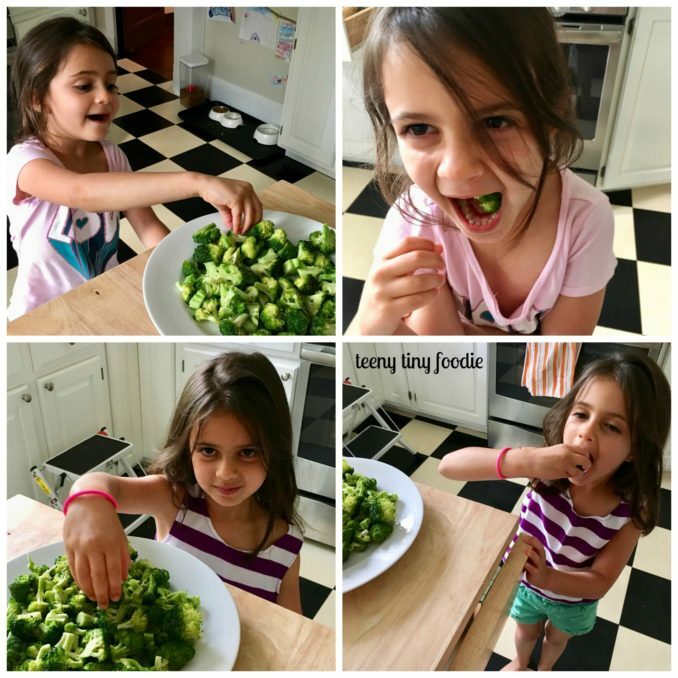 After Eliana tore the broccoli florets off the head, I went through and chopped them up a bit. Step 2: Heat olive oil and garlic cloves in a pan over medium heat (see tip above) for around a minute. Step 3: Add broccoli florets and a couple pinches of salt to the pan and stir. Step 4: Cook the broccoli for around 6-7 minutes stirring often (see tip above), until it is tender but still has a crunch. Step 5: Transfer broccoli to a plate and sprinkle with a small pinch of pepper. Taste and adjust seasonings as desired. This “better than potato chips” recipe officially earned Two Thumbs Up for deliciousness.